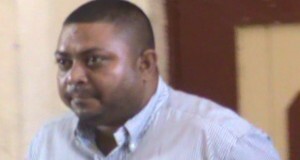 Self-confessed drug trafficker, Barry Dataram Monday night accused Guyana’s Customs Anti-Narcotics Unit (CANU) of being involved in the cocaine trade with one unnamed agent raking in as much as GYD$10 million to allow cocaine to leave the country. Dataram explained that GYD$5 million is paid upfront by the trafficker and the remaining 50 percent is paid on arrival of the cocaine in the United States or Canada. He said at least 30 to 40 percent of the 129 kilogrammes of cocaine seized from his home at Diamond, East Bank Demerara in April, 2015 is back on the streets. CANU said Barry Dataram’s “savagery” against that law enforcement agency coincided with the commencement of his trial for that drug bust. Asked whether he is a drug lord, Dataram responded: “Yes I do drugs. I wouldn’t say lie” but “I have never been convicted.” Dataram, also an American citizen, is wanted by the United States for drug trafficking. A previous extradition request failed because of legal loopholes. Describing himself as a businessman, Dataram challenged CANU to respond to the allegations. However, CANU in turn challenged Dataram to state his involvement in the drug trade under oath. “CANU on a positive note welcomes the frank confessions of Mr. Barry Dataram as to his involvement in the narcotics trade and would implore him and others like himself connected to the narcotic trade both small and large; mules and traffickers alike; to attend the nearest court, police station and or the CANU Head Quarters Georgetown to provide useful intelligence ( by way of a sworn statement ) in past and ongoing investigations and operations,” the agency’s head, James Singh, said. Meanwhile, Barry’s nephew, Troy, accused CANU of stealing GYD$3 million out of GYD$12 million and other valuables that were seized from his home at Patentia, West Coast Demerara on February 18, 2016. He said he noticed some of the money missing while it was being counted at CANU headquarters. Other items, he said, that went missing, included a diamond bracelet, one cricket band, one Citizen gold watch, his driver’s licence and Identification Card. Troy Dataram said the money was sent from Canada to purchase land and so it was being kept on standby to pay for it as soon as the deal was closed. However, CANU said in a statement that Troy Dataram has admitted to an independent investigators that the money seized was actually GYD$9 million and that he apologized for the fabrication. “Without delving into the details of the ongoing investigation Troy Dataram without any assistance from Barry Dataram after pages of relating a particular story as to his ownership of twelve (12) million dollars borrowed from a cousin in Canada to purchase land in Guyana exclaimed much details to the effect that he was sorry that he lied to the investigator about the quantity of cash retrieved in the operation and instead that is was in fact nine (9) million Guyana Dollars,” CANU said in a statement.